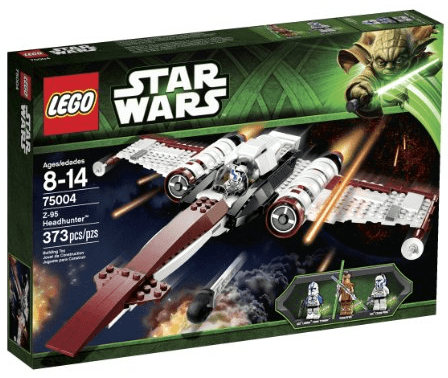 Save 28% on the LEGO Star Wars Z-95 Headhunter 75004, Free Shipping! The LEGO Star Wars Z-95 Headhunter 75004 is on sale for $35.80 at Amazon right now. That's 28% off the list price of $49.99! Includes 3 minifigures with assorted weapons and an accessory: Clone Pilot, 501st Clone Trooper, and Pong Krell. Features Z-95 Headhunter with retractable landing gear, opening cockpits, tool rack and a LEGO® Technic shooter! Measures over 3″ (9cm) high, 15″ (39cm) long and 12″ (32cm) wide. Invade the Separatist skies with the Z-95 Headhunter starfighter with retractable landing gear, a LEGO® Technic shooter and more! Weapons include 2 double-bladed lightsabers and a blaster.